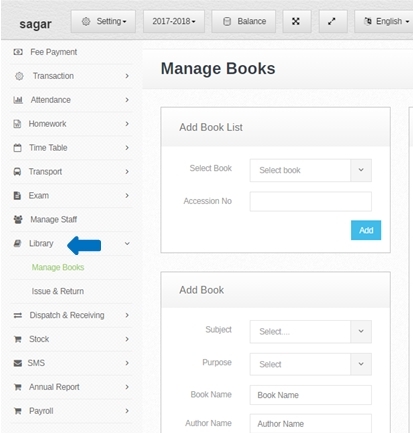 Step:-1 library management software to manage all library books record . you have to enter all book name and detail in this software . 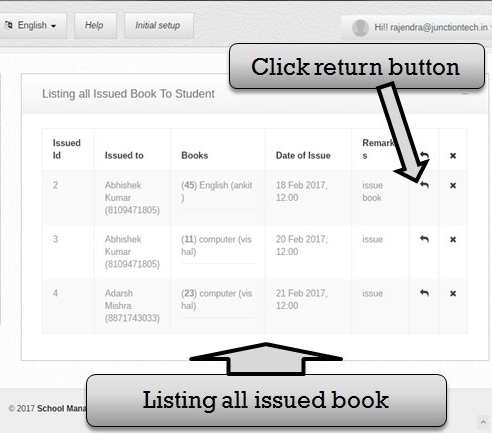 teacher and student issue book detail and return book detail save in this software .this software is vary important for school and college library . 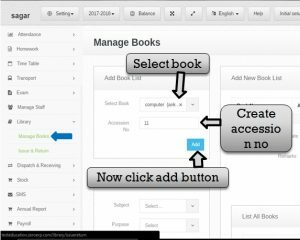 Step:-2 In library management software you have to click library option and select manage books option and in add book please select subject , purpose ,enter book name , publisher and book price then click add button & book detail save successfully in book list . Step:-3 Select book name and enter book accession number then click add button . book add successfully in book list. Step:-4 New book add in book list then enter date and book description in remark box . click confirm button book add in all book list . 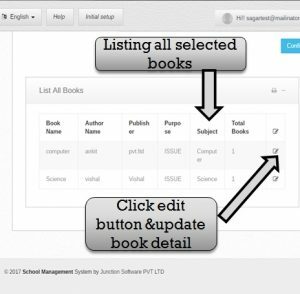 Step:-5 Listing all book then you have to click edit button and update all book detail like select new subject name , enter new book name etc . 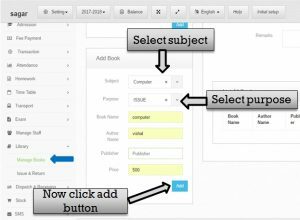 Step:-6 Now you have to click edit button open book detail if you have to change book name , subject name , and book detail then click add button and book detail update successfully . 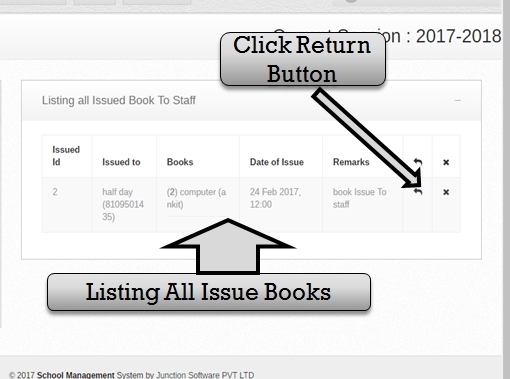 Step:-7 Book issue and return you have to click library option and select issue and return option . if you have issue book staff and student . please select student and staff option . 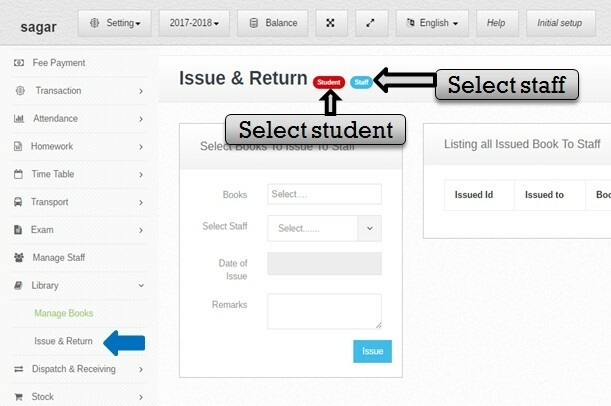 Step:-8 book issue and return option click student menu then select book name ,student name ,issue data and click issue button book issue for student successfully. Step:-9 Listing all issue book for student . 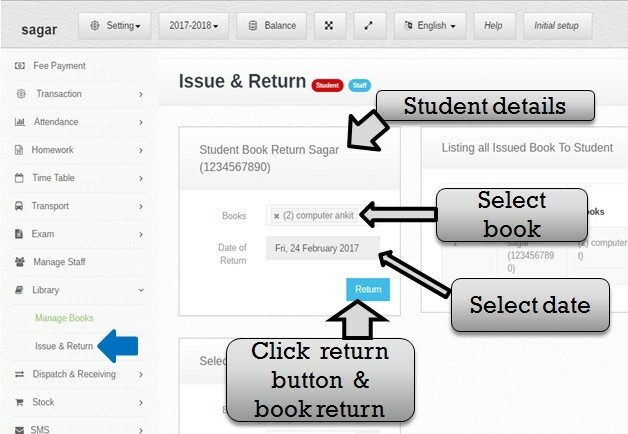 now you have to click return button then student return book form open . fill all student detail then student book return . 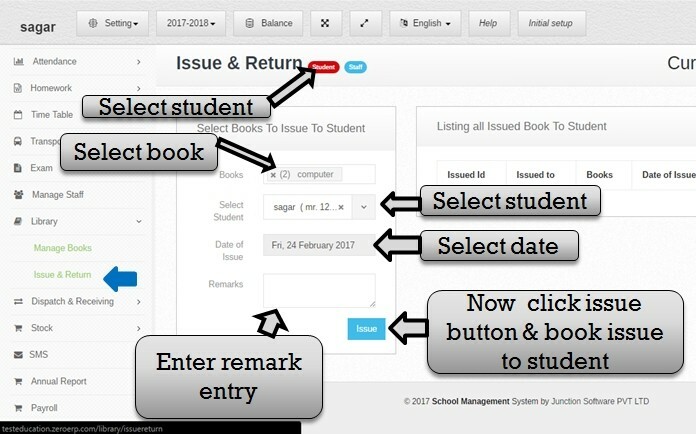 Step:-10 Click return button then student book return form open and student detail show now you have to select book name and enter book return date then click return button and book return successfully . 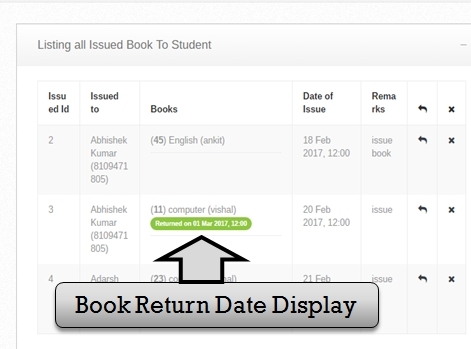 Step:-11 Student book return list showing and student book return date display . Step:-12 Now you have to select staff then open book issue form . 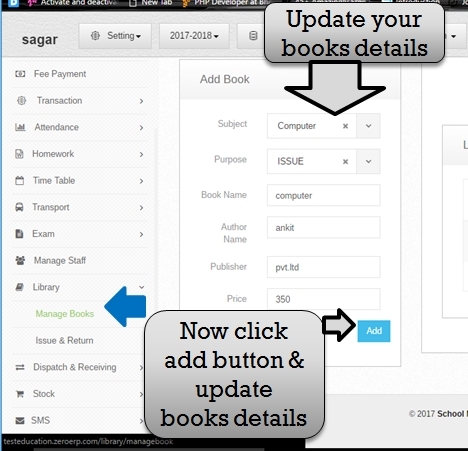 please select book name , staff name and enter book issue date then click issue button . book issue for staff successfully . Step:-13 Listing all issue book for staff . now you have to return issue book click return button . book issue staff detail show . Step:-14 Staff name and detail show . 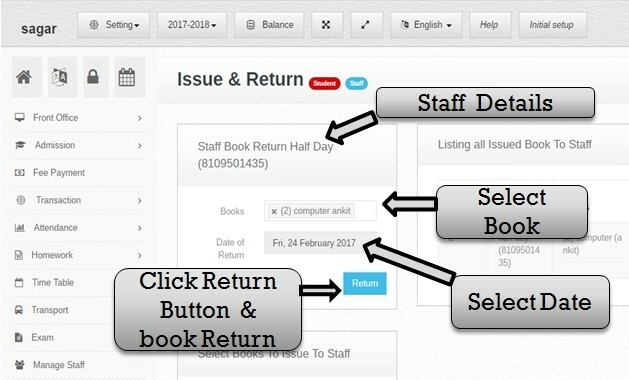 now you have to select book name and enter book return date then click return button staff book return successfully . 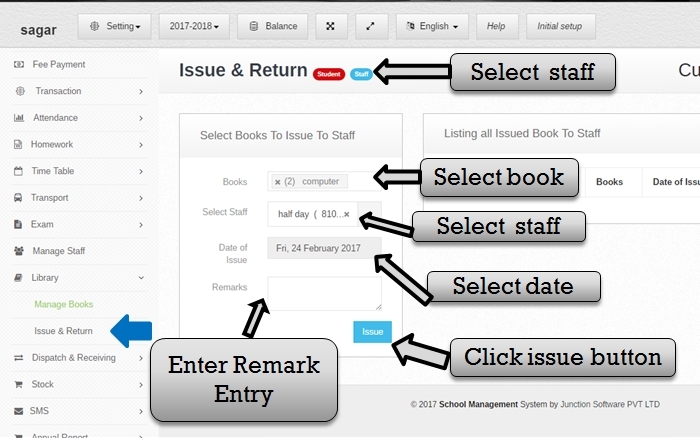 Step:-15 Staff return book list show then book return date display successfully . Simply loved your services. I need help in library management system.